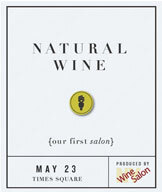 The NY Wine Salon‘s first “salon” occurs on Monday, May 23rd from 9pm-11pm at NYC’s Metropolitan Room and for this one they’re going “au naturel” in Natural Wine: A Salon. What does that mean? Well it means that they’re going to demystify what “organic” means when it comes to wine by explaining the differences (and similarities) between the organic, the sustainably farmed, the biodynamic and more. The best part, you’ll get to sample them along side delicious bites including cheese, charcuterie and who can forget the inevitable slices of bread? The event will offer you dozen of wines from various parts of the country…On earth day we told you to think “gruner” (aka green) and it looks like the NY Wine Salon is thinking that way too – even more incentive to go! So who’s on the panel? Just some of the cities top people, of course: Alice Feiring, author of forthcoming Naked Wine; Barbara Shinn, Shinn Estate Vineyards; Pascaline Lepeltier, Rouge Tomate; Christy Frank, Frankly Wines; Jeff Weissler, ConsciousWine.com; moderated by W. R. Tish, New York Wine Salon. Tickets can be purchased for a modest $45 here… (use code “Winesday” or $5 off.) After all, believe it or not, you’re going to need something to ease you into yet another work week.